Temple Grandin sees things in pictures. Her mind can recall every "picture" it has ever taken and allows her to see the world and solve problems in unconventional and brilliant ways. Her condition is known as autism and Temple used this to help her revolutionize the beef industry and give us the modern method of cattle slaughter. 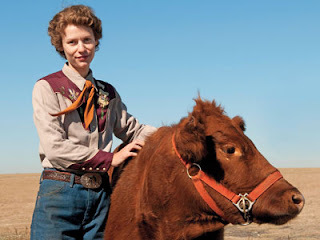 "Temple Grandin" is an ambitious film, because its subject matter does not seem like it would connect with a modern audience. However, the sheer charisma of Temple has you rooting for her from beginning to end. Much of this is due to the absolutely phenomenal performance put forth by Claire Danes. Her portrayal of the spunky Temple is endearing, funny and touching. The only complaint I have about "Temple Grandin" is that it is not nearly long enough. The film would have benefited from about twenty to thirty more minutes on its runtime to flesh out the relationship between Temple and her mentor Dr. Carlock (played by the brilliant David Strathairn). And perhaps could have espoused upon some of Temple's days in college after she became "accepted" by her peers. This is a simple film that deals with a delicate and complex condition with more heart and grace than almost anything I have seen on the subject and all due to an Oscar worthy performance by Claire Danes. Unfortunately, "Temple" is a made for television movie by HBO, but she netted an Emmy along with several other much deserved awards.